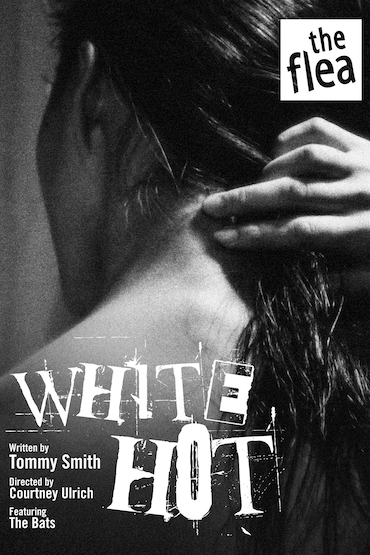 “Tommy Smith’s incendiary White Hot limns the paradoxical thrill of self-erasure” 4 out of 5 Stars! The lives of two sisters collide in an epic portrait of self-destruction. A brutal comedy about how cruel we can be to the ones we love, when we want what they have. In her directorial debut, White Hot features Flea Resident Director Courtney Ulrich and The Bats, the resident acting company at The Flea. Tommy Smith’s work includes Nectarine EP (The Flea Theater), Lotus Eaters EP (IRT Theater), Pigeon (Ensemble Studio Theatre; dir. Billy Carden), The Wife (Access Gallery; dir. May Adrales), White Hot (Here Arts Center; dir. May Adrales), Sextet (Washington Ensemble Theatre; dir. Roger Benington), PTSD (Ensemble Studio Theatre; dir. Billy Carden), Air Conditioning(Eugene O’Neill Playwrights Conference; dir. Steve Cosson), among others. His work has also appeared at PS 122, The Ontological Theatre, Soho Rep Writer/Director Lab, The Yale Cabaret; internationally, he has been produced in Prague, Edinburgh, Amsterdam, Montreal, Berlin and Athens. His award-winning theatrical collaborations with Reggie Watts have played at The Public Theatre, Lamama, The Warhol Museum, MCA Chicago, ICA Boston, On The Boards and PICA: TBA, among others. He is the recipient of the PONY fellow at The Lark, a two-time winner of the Lecomte du Nouy Prize, a recipient of the E.S.T. Sloan Grant, a winner of the Page 73 Productions Playwriting Fellowship, and a recipient of the Creative Capital award. Publications include Pigeon for Dramatists Play Service, White Hot in the New York Theatre Review. Recently, his feature film Figment was optioned by Ridley Scott’s production company ScottFree. He is a graduate of the playwriting program at The Juilliard School. He lives in New York City. Courtney Ulrich is a NY-based director, with a BA in Theater and Performance Studies from Georgetown University. In New York, she has worked with New Dramatists, Target Margin Theater, The Foundry Theatre, Rising Circle Rep, Dixon Place, The Culture Project and Powerhouse/NYSAF at Vassar College, in LA with Cornerstone Theater Company, and in DC with Sojourn Theatre Company and Arena Stage. She is a Resident Director at The Flea Theater.